The third Donkey Kong Land had two releases, one for regular Game Boy and the other for Game Boy Color that was exclusive to Japan. 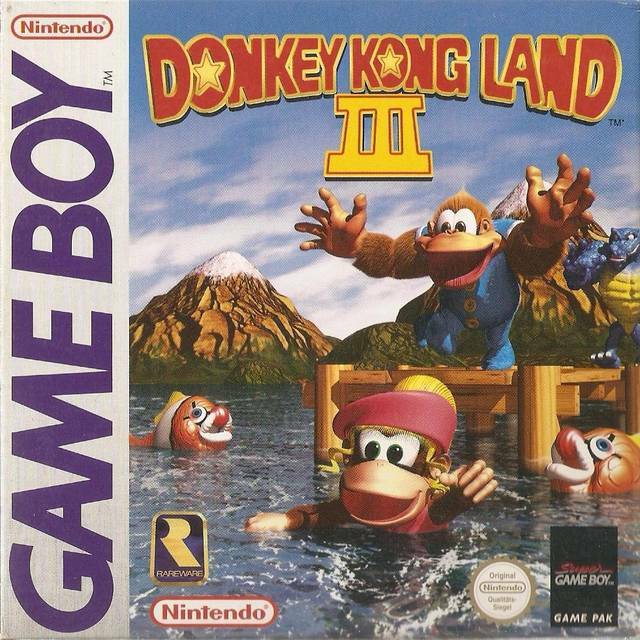 Unlike Donkey Kong Land 2, Donkey Kong Land III has many completely new levels and worlds. While they are similar to Donkey Kong Country 3‘s levels, they are different enough for Donkey Kong Land III to feel like its own game instead of a downsized port. Like the two DKL games before it, it came in a yellow cartridge and is enhanced for the Super Game Boy. Many of the new levels are a lot less gimmicky than Donkey Kong Country 3‘s, which can be both a good and bad thing. On one hand, the levels feel a lot more challenging and test your platforming skills more, but on the other, many of them tend to blend together because there is not a lot to set them apart anymore. Even though many of the levels are new, the bosses are mostly the same. The ones being used are Barbos, Bleak, Arich, KAOS, and Baron K. Roolenstein. Notably, Bleak, a gigantic snowman that you fight in a kind of rail shooter segment in Donkey Kong Country 3, is now fought in 2D, resulting in a completely different fight. A few other things are changed too. Like before, the Kongs have lost their ability to throw each other due to no two Kongs being onscreen at the same time. 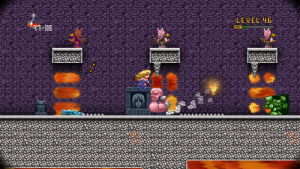 The elephant can no longer hold barrels and has unlimited water, making elephant segments much easier than in the console version. Parry the parallel bird is missing altogether. On the overworld, you only have one bear instead of several. He gives you hints, lets you use his teleporter for a price, and hosts a minigame that lets you unlock various items needed to complete the game. The banana birds have been cut entirely. There are six worlds, the last one being The Lost World. They’re completely new worlds with similar themes to many of the levels in Donkey Kong Country 3. Notably, one of the new levels is called Miller Instinct, a play on Killer Instinct, Rare’s fighting game series, which was incredibly popular at the time. After you unlock The Lost World, defeat the final boss, and collect every item in the game, you unlock Time Trial. Time Trial has you go through certain levels and beat specific times. It’s a pretty cool concept that is not in any other Donkey Kong game before it. Donkey Kong Land III was a very late release for the Game Boy. In Japan, a port was made for the Game Boy Color, released in 2000, called Donkey Kong GB: Dinky Kong and Dixie Kong. There are some minor changes aside from the game being entirely in Japanese. The world maps don’t look as good, the title screen is different, and the game moves a little bit faster. The faster game speed helps alleviate the scrolling glitch, which was first seen in the first Donkey Kong Land. It’s not completely removed, but it is noticeably less obtrusive. Otherwise, it’s pretty much the same game.